St. Paul’s Church is oozing with history. It’s Halifax’s oldest building, founded in 1749 but completed a year later, with wood brought from Boston by ship. Many ‘firsts’ are found here. 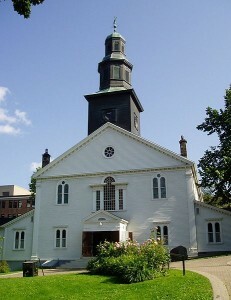 It’s Canada’s first Anglican church and home to the country’s first Sunday school. St. Paul’s is also Britain’s first overseas cathedral, a title it gained in 1787 and held for 78 years. When you visit, look for a wooden sill embeded into the wall, above the memorial doors. It was thrown there by the force of the Halifax Explosion in 1917. Guided tours of the church are offered during the summer but you can visit any time. Directions: 1749 Argyle Street. Bus routes 1, 3 and 7 pass by. Within strolling distance from many downtown hotels. Admission fees: Free but donations appreciated. Opening hours: Year round, 9am to 4pm.